Pioneer Day is July 24th here in Utah (it's a state holday - the day the saints arrived in the valley) so we'll be having a Pioneer themed singing time this Sunday! Don't feel that because you don't live in Utah, you can't celebrate the pioneers - they are part of our church's heritage and the summer makes for a great time to bring it into primary and especially singing time! If you'd like to print this at home instead, I've tiled the above image HERE to print on 8 sheets of paper. I'd recommend printing on cardstock and laminating if you want to use it again. I will be playing all the pioneer songs on the Children's Songbook CD, beginning in order. I will also be posting the words (if you don't know how I do that, check my "Posting Words" tab above - and there are some pioneer songs missing, I'll get them up soon!). Some of these songs are unfamiliar and my goal this Sunday is NOT to learn the songs but to get the kids to listen, become familiar and sing along if they can. As each song plays and we sing along, I will have the kids listen for things the pioneer children did in each song (washed in streams, walked, prayed, played games, camped, read, picked up chips, etc.). You can download my brief summary of all these links HERE that I'll be reading in primary at each stop. (If you'll notice there are only 5 stops on the map, but there are 6 links so I omitted the Exploring Nauvoo, or #2 option). The second option is what I WOULD do IF I could convince my current primary presidency to combine sharing time with me and they'd help with this part (but they are somewhat fickle about combining so I'll be sticking with my first option - bummer! I may just intertwine a few of the simpler items listed below). #1. Pioneer Cake Walk (find details HERE) - to move it along, just give everyone a piece of hard candy after the first song is over :). #2. 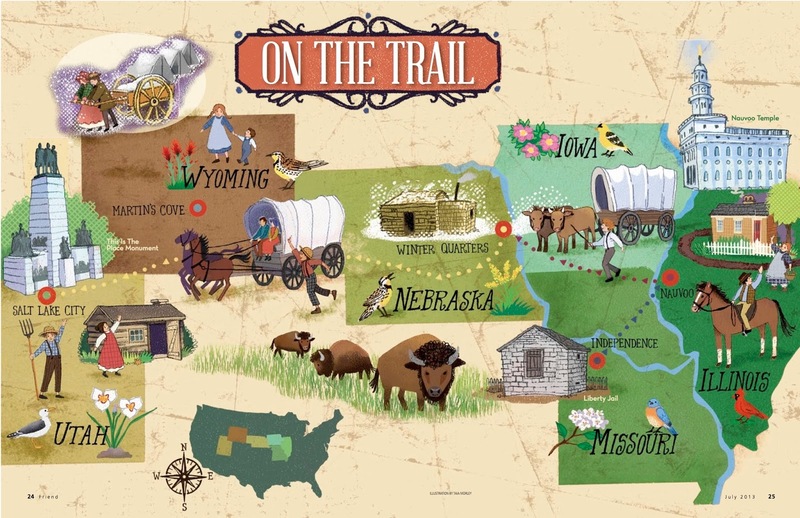 Read a brief section from the Exploring Nauvoo link above or sing and play a pioneer song using chimes or handbells (find details HERE). #6. Make homemade butter and eat it on a cracker (details HERE) or pass out some hard candy! If you go with the butter route, make sure you start it at the beginning of singing time - maybe have the adults all shake. I haven't quite worked this out yet! I suppose there is a third option and that is to omit all the (1-5) milestones - I'd recommend this if you are short on time! You can also scroll through all of my Pioneer Day posts HERE! Random thought...but I think this 2nd option could actually be really fun as a life size map - use for a fun Pioneer activity day out in the parking lot! Draw out the map in chalk and strategically place each of the 5 spots on the map with a station with the various activities and stories I have listed above. Maybe incorporate a song at each station and answers move the kids along the path. Fun fact I learned from sister missionaries at the Winter Quarters trail center is that it was a tradition in some companies for everyone to start singing along if someone started sing "Come, Come, Ye Saints." Thank you for the time and effort you put into sharing your idea! In 2013 I made a poster boardgame of this map, similar to your idea and cut out the 2 handcarts from the magazine to use as game pieces,and we had teams (you could all be on one team representing one handcart as well, to work together or add a little competition). I made the states colorful pieces to lay over and as they moved along a child would remove that "puzzle piece" with pioneer song titles on the back of each piece. 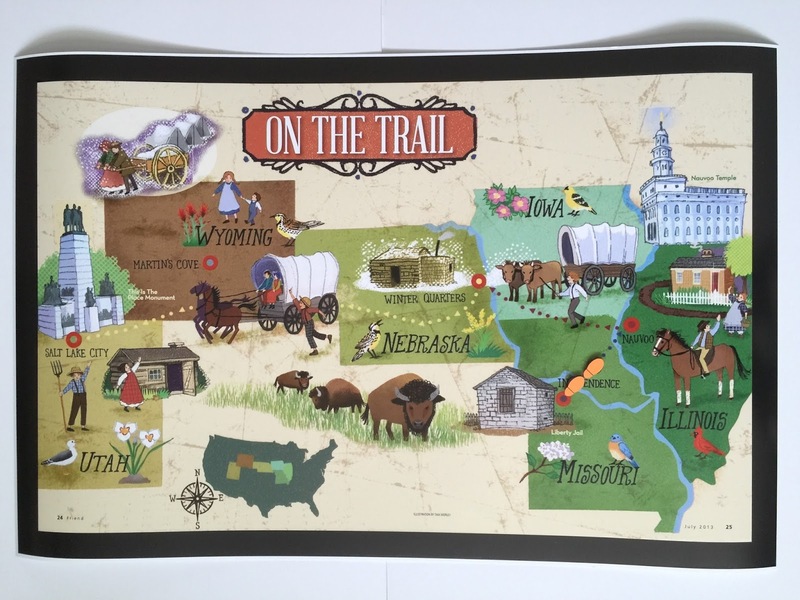 Each piece lifted revealed the state and more of the trail beneath (way time consuming -I like your idea to print board much better! But you could still have pieces covering the trail.) As the kids sung well they'd progress and each stop the handcarts made we'd have a child read a pioneer story or experience for that location! They loved it and it went really well! We'd play the song thru then sing, and had words printed on pictures they could hold up as classes, so they got involved and enjoyed it! I'm in charge again this year and misplaced or gave my old one away when I was released so I'm totally printing at Costco tomorrow and using Sunday! Thanks, you're a lifesaver!